While a lot of schools are teaming up with third-party companies to launch online versions of long-standing degree programs, USC's business school is doing the work in-house. Here's why. The first time Patricia Mills was invited to serve as a "guinea pig" instructor for a new program to turn one of her face-to-face tax classes into an online course, she was open-minded but highly skeptical. This clinical professor of accounting at the University of Southern California Marshall School of Business checked out samples of other courses created by Marshall's Online Learning unit, and couldn't see how her classes would work in that format. "I had no clue how to envision it differently than the way we had always been doing it, which is getting up in front of the classroom, teaching from a textbook and Internal Revenue code and regulations, going through numbers and calculations and writing things on the board," she recalled. On top of that, she had always assumed the students needed her presence and her lectures in order to learn the material. The proposed online format made her question the role of the instructor in the classroom. And she was concerned that somehow the USC "brand" might be watered down. Now, Mills unequivocally states that going through the process of converting her course to an online format has made her a better instructor. Here's how USC Marshall works its magic. Marshall is introducing an online master's in business administration this year, adding to a portfolio of five other MBA offerings already delivered by the school. First, however, its internal online learning organization got its feet wet by developing two smaller master's degree programs: one in business taxation (the program Mills is involved in) and another in global supply chain management. One limitation on growth is faculty expansion. "Right now we don't want a lot of big sections until we can hire more faculty," she said. The process of hiring can take about a year for any given position. "We meet with a lot of people and go through a lot of portfolios and interviews, and then we hire those who we feel are the best people. We don't go out and do wholesale hiring." Marshall could have chosen to contract with an outside company to build its newest MBA program. After all, USC has plenty of experience in the practice. The business school had already worked with Embanet, a Pearson company, to launch a master's program in library and information science, and USC's schools of education and social work contracted with an outside service provider (2U) to build online programs as well. Chrystal chose to come down on the side of internal development. "We want to do in-house instructional design with our curriculum people, our professors and our production people. We really feel then that we can make quick changes the way we want them. If something doesn't work, we can make the change right now. We don't have to be in line with the four other clients that the company has." Besides that, there's the practical question of revenue sharing. "If you go with an external partner, depending on the company and the contract, you're doing a healthy revenue split," Chrystal noted. While in-house development doesn't come cheap, she said, "We call it research and development. We call it faculty training. The dean and the cabinets have all said this is where [they] want to invest the money now. And we do believe in three to five years we will have a steady state of several hundred students in these programs" — without the revenue split. However, Chrystal was quick to affirm that business school's deal with Embanet "has been satisfactory in every way. They've done everything they should. This in no way says they are not good or the idea of an external partner is not good." And she's not averse to using outside help. Currently, for example, her organization is interviewing several service providers to help with marketing and recruitment for the online programs. "We have a small, wonderful marketing group, but they can't take on five new masters programs. They just don't have the bandwidth to do that," she explained. "We're going to somebody that has expertise particularly in digital marketing because that's where most of our prospects are going to come from." The Online Learning team schedules a course conversion process four to six months in advance. That's how long it takes to do it right, said Chrystal. In fact, she added, faculty "have to sign a memo of understanding with us saying that they will give us four to six hours per week for four to six months prior to teaching the class." For those new to the process, the first go-around will take longer than the second time. "If you're doing a course for the second time, it's much, much easier, because you have the ideas, know how to set up the outcomes, [understand] what kind of assessments you should do every week. It's just easier to understand the whole process," she noted. In the first phase of a course re-conceptualization, an instructional designer meets with the instructor to understand the learning objectives — what a student will need to know by the end of the class — and the learning outcomes — how learning will be assessed or measured. That process, said Jerry Whitfield, associate director of online learning, gives the class a "very clear structure." It also opens up the instructor's eyes to the essential purpose for the instruction, something he or she may never have thought much about. As Mills noted, a lot of the faculty at Marshall come from "practice." They've learned what they know by doing it out in the field and were never really trained in how to teach. "The idea of really putting a lot of attention to the learning outcomes was brand new to me," she said. "We kind of knew what we wanted the students to know, but the faculty didn't necessarily focus on learning outcomes and how to get them across." Once the objectives and outcomes are mapped out, the instructional designer leads the faculty member through possible formats for the course. As Whitfield explained, "It's one thing to listen to an accounting instructor sitting in a classroom for two hours. It's a completely different thing to have to do that same experience if you're sitting behind a computer monitor and you don't have any feedback or other students sitting around you. The challenge is to take that same instructor and that same course content and make it engaging." Fortunately, he pointed out, "You have more tools available to you to make a course engaging online than you do in a live classroom setting." In Mills' case, the lengthy lectures were replaced with a multitude of activities. One of them was the simple use of discussion boards. "When I first saw that, I thought, oh, that's just a little bit of make-work," she admitted. But what Mills discovered is that the use of online discussions encouraged all the students to converse — including people who typically didn't want to talk in class. "Suddenly I had 100 percent involvement that I never had in the classroom," she said. Another new technique was the use of outside guest speakers. "That was something the instructional designers pushed me to do," recalled Mills. "I thought, I'm the expert. Why am I doing this?" She added, "It turned out to be fabulous. Students just love it." For a tax research class, for instance, she pulled in the head of a tax policy department at one of the "big four" accounting firms based in Washington, D.C., to discuss the tax legislative process. For another she called on the head of a real estate investment and trust practice. "That's a specialization we don't have among the faculty here," she noted. To film those guest lecturers, the online learning team's production crew may visit the expert on site or set up a remote recording session. "It makes the class so much better than I had in the classroom," Mills said. For another course, an instructional designer recommended that Mills set up a fictional case study. The business school hired actors to perform in video scenarios to illustrate the situations that the students would face in dealing with partnership taxation. And Mills herself stars in "mini-lectures," videos that last two to five minutes and introduce a particularly difficult topic or provide background. 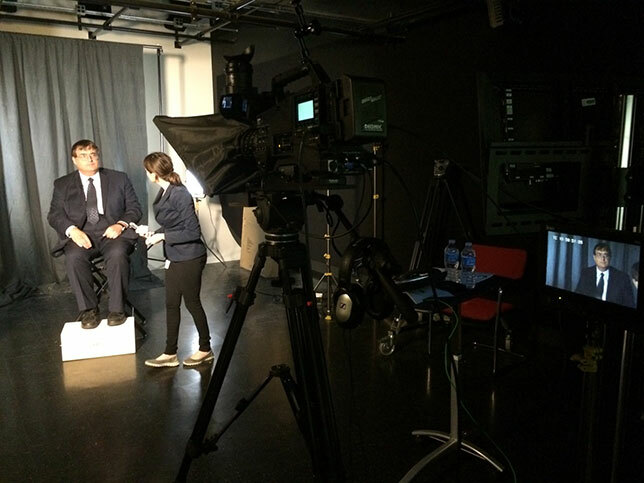 Those videos are filmed in the school's production studio en masse and chopped up for use throughout the term as required. Whatever format the presentation takes, Mills added, it is supplemented with interactive exercises "where students are able to apply what they just learned." Ultimately, said Mills, "I really feel like the course is now more of a perfect creation than what I had before, when I would just week-by-week walk into the classroom." Many of the techniques and artifacts have found their way into her traditional courses as well, so those on-campus students can also benefit. To help foster a personal connection between instructors and students, every online course developed internally at Marshall includes a one-hour real-time session. Currently, that's done through WebEx, which allows participants to see the instructor interacting with them and the faces of at least six students. The instructor can view the names of all of the students and click on a name to bring that person's face onto the screen, as well as hand screensharing over to that student to act as the controller for sharing a paper or presentation. In particular, the Online Learning team wants to make sure each course retains the qualities that distinguish the individual faculty member. "We want each professor's idiosyncrasies to show in each video. We want those idiosyncrasies to be visible in the weekly online synchronous sessions," said Chrystal. For example, one instructor "loves to wear a bowtie," she explained. Each week he kicks off his classes with a story that goes along with the tie. "It's a 30-second thing that he does. He's done it for years, and it's brilliant and everybody loves him. That's him. I couldn't do that with anybody else without making it look very corny." Keeping those personal elements in the program helps ensure the professor feels more comfortable and so do the students. "They won't feel they're getting a cookie cutter template for every course," she said. Although it isn't unknown for some institutions to set up instructors in front of a webcam and let them record their own lectures, that kind of low-cost production quality doesn't suit Marshall. As Whitfield stressed, "It's not engaging. It's not professional. You don't have a control of the quality from instructor to instructor. The instructors aren't necessarily all going to be on the same page as far as how they structure their given classes." Plus, he added, "You don't have the opportunity in that scenario to make the courses better, to help the instructors do things in ways they may not even have thought of." Whitfield, whose own master's degree came from what is now USC's School of Cinematic Arts, likened the job to filmmaking. "The writer could put in the script that the character says in the dialogue, 'Gee, I love Coca-Cola.' Or visually they could represent that by [showing] a character walking through a house. You see posters of Coca-Cola on the wall. He opens the refrigerator; it's full of Coca-Cola. You see empty Coca-Cola cans everywhere. It's the same point, but which is more effective? That's what we strive to do with all of the courses. We want to make them more effective using visual tools." The interactive activities in Marshall's online courses keep students engaged in the content, but they also provide a way for faculty to make sure their students understand the learning objectives. Through quick quizzes, for example, an instructor can uncover what isn't fully understood by the students and expand on that immediately in the synchronous session. "I can correct it right then," said Chrystal. "That's a big contrast to what happened traditionally in all of our courses, which was course evaluations at the end of the semester." In other words, the online course conversions can make for better outcomes in student learning. Of the 17 faculty members who have taught in the online courses over the last two years, "not all of them love to teach online," she observed. "But all 17 of those professors said that when they went back to their residential classes, their teaching was better. They're saying it's valuable, so I know it's good for our students."